(Before you begin soak dried mushrooms in a cup of very hot water until soft (1 hour)- This is for mushroom gravy and is optional. 1 – 15 oz. can of chickpeas drained and rinsed — or you can use 1 1/2 c. dried chickpeas, soaked overnight and pressure cooked on high for 8 min. 1 – 1 1/2 tblsp. soy sauce or 1 1/2 tsp. light miso blended in a bit of vegetable broth to liquify it. 1. Saute the onion and garlic in the oil, add the herbs, except for the fresh rosemary, which I put in last to keep the flavour. 2. Whisk the cornstarch and broth together in a small dish. 3. 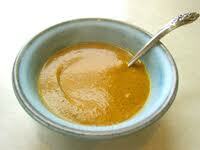 Put the chickpeas in a moulinex with some of the broth mixture and soya sauce or miso to make them blend easier. 4. Moulinex them on high until it is velvety. 5. At this point decide if you want the veggies to have texture or not. If you prefer silky gravy, put all the veggies in the moulinex with the chickpea mixture. If you don’t mind bits of onion and garlic, just put the mushrooms in, and moulinex until they are incorporated with the chickpeas. Or if you like bits of mushroom ,moulinex them separately and put them to one side in a dish, to add later to the bubbling gravy! 6. Add the herbs, worchestershire sauce peeper and miso or soya sauce and the rest of the broth/cornstarch mixture. 7. Allow to simmer until it thickens. Add the chopped mushrooms if you didn’t do it in step 5. 8. Add the fresh rosemary. Simmer a few more min. …taste and adjust the seasonings. Enjoy. You can double or triple the recipe and freeze it for future meals. Excellent on vegan bean loaves, burgers, mashed veggies.